India's construction sector contributes about six per cent to her Gross Domestic Product. In the Tenth Five-year Plan currently unfolding, that figure is likely to go up. The plan envisages massive construction activity across the country. Over 60 per cent of the total plan outlay is likely to be spent on construction components alone. Question is: how many bricks does that translate into? Says Rakesh Verma, of the All India Bricks and Tiles Manufacturers Association (aibtmf), "According to the data provided by our state associations, there are nearly 60,000 kilns operating all over the country." But this is a guesstimate. And how many bricks do these turn out? He cannot say. "The production capacity of a brick-manufacturing unit depends upon how big the ghera (area of the circle around its chimney) is. 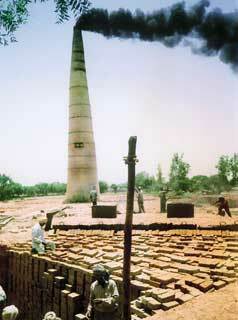 A big kiln with a comparatively bigger ghera produces more than 30,000 bricks every day. Medium and small kilns produce 20,000 and 10,000 per day respectively," he informs. Beyond this generality, no calculation exists of how many of the 60,000 kilns fall into these categories. It is an informal economy, after all. Says Rajesh Kumar Gupta, who owns a kiln on the road that runs from Aligarh to Mathura in western Uttar Pradesh, "If you want to install a bhatta (brick kiln) , you will need at least 20 bigha s of land. This will cost between Rs 7 lakh to Rs 10 lakh, depending upon the rate of the land in a particular area. Rs 3 lakh to Rs 4 lakh are needed to install a pakki chimney. Rs 2 lakh to Rs 3 lakh we keep to give to labour as advance. There are other miscellaneous expenses, such as the cost of fuel." Rs 12 lakh to Rs 17 lakh in all, a sizeable amount. Who would invest such a sum if the returns weren't better? Bigger the kiln, it seems, the more the profit. As Sanjeev Kumar Singh, president, Mathura Brick Kiln Association, says, "If you have a kiln with a bigger production capacity, you can make more profit because you will produce more bricks with the same quantity of coal." He undercuts himself immediately. "What if your stocks are not sold for a week, where would you store them? Ultimately you will sell them below the market price and incur a loss." Shyam Singh runs a small kiln in district Bulandshahar. The unit runs on a 25-day cycle producing nearly 6.5 lakh bricks. "The business is profitable if the cycle completes perfectly and no fuel or labour problem occurs," he says. "But a problem may occur on any of the two ends (putting mud bricks in, taking made bricks out during the burning), or the pathiaya (the mud brick maker) runs away. Besides losing our advance given to labour, we also run into loss because this interrupts completion of the circle. In such a case, production stops, for there is no mud-brick to burn. We have to pay the money to those who worked but don't earn anything." Singh's lament notwithstanding, brickmaking is whiplash business for 7-8 months in a year -- September to April in north India. 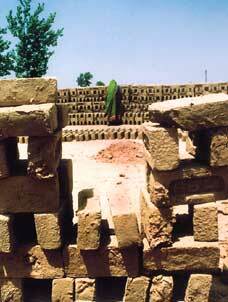 Avoiding the monsoon, the kilns furiously produce various grades of bricks. " Avval and doyam, two better-quality bricks, are used in building and priced high: Rs 1,500 to Rs 1,700 per thousand bricks," informs Hari Om, another Bulandshahar kiln-owner. "The price of Soyam and talsa, two inferior-quality bricks used in foundations, remains between Rs 1,000 to Rs 1,200 per thousand bricks. Chatka is of the worst quality. Used in road construction, it is priced around Rs 900." Prices rise during the monsoon, or when demand outstrips supply, or when policy threatens to upset the unorganised cart. This happened in late 2004: " aibtmf called for a nation-wide strike in October last year against the flyash notification that forces us to mix flyash in bricks," says Verma. "Production stopped for nearly three-and-a-half months. In December, the price of a thousand bricks reached Rs 2,700, the highest ever." Vanishing topsoil is the greatest hidden cost of making bricks. There is the land on which a kiln has to be set up. This land kiln-owners buy. But there is also the land from which is dug out the clay that forms the raw material of the business. "The cost of land is one of the major investments in installing a brick-making unit, so purchasing land for topsoil is not a viable option. That's why we prefer taking such land on lease for three years," says Hari Om. And so kiln-owners make a beeline for the countryside. "The rent (for prime agricultural land) in rural areas is very low, between Rs 15,000 per bigha to Rs 25,000 per bigha for three years," informs Singh. The rate also depends upon the distance of the field-turned-raw-material patch from a town. "It reaches Rs 35,000 per bigha if the land is near the town," Singh adds. Moreover, "Among the lease conditions is the depth up to which the land will be dug, between four feet to five feet." Exactly how much topsoil gets swallowed into the maw of the furnace? "We need to dig one bigha (approximately 620 square metres) of land up to a depth of one feet to meet the soil demand for making a lakh of bricks," Singh says. In terms of his calculation, the manufacture of a million bricks would lead to a direct loss of 1,892 cubic metres of topsoil. But soil, particularly topsoil at a depth of one to one-and-a-half metres, is not simply the physical material on Earth's surface: probably its most important component is the living organisms within it. Healthy soil contains extremely large numbers: a typical arable soil -- precisely the kind used to make bricks -- may contain 100 million bacteria/gramme. The rhizosphere, the thin layer immediately next to a plant root, typically has 1 million bacteria/gramme. Also, in one gramme of healthy soil there can be 15,000 to 20,000 different species of bacteria. Fungi are also very important -- especially mycorrhiza, which form close associations with plant roots. One kilometre of fungal hyphae have been detected in one gramme of soil. Does not the land used to extract clay from lose, then, its microbial diversity, thus reducing its fertility and regenerative capacity? Kiln-owners agree that the land on which the kiln is located becomes completely unusable. Soil science bears this out. The burning process used to fire clay bricks changes soil chemistry and soil biology. The heat penetrates the soil up to a few centimetres. As a result, bacterial and fungal populations decrease immediately -- and substantially -- in the top 2.5 centimetre of the soil. Repeated burning permanently diminishes bacterial populations by more than 50 per cent and also decreases soil respiration. Similarly, long-term burning reduces total nitrogen and carbon and the potentially mineralised nitrogen content in the 0-15 cm soil layer. But kiln-owners also argue that the land used to extract clay can be reclaimed. Disagrees J M Bhatnagar, deputy director and head, clay products division, Central Building Research Institute: "It takes years to reclaim that land. Bricks are made out of argillaceous mass (like clay), which are largely hydrous alumina silicate systems. These hydrous alumina silicates are the weathering product of rock mass, which takes hundreds to thousands of years in transforming to its present usable form. "It (the topsoil) is almost non-renewable," says Dilip Biswas, ex-chairperson, Central Pollution Control Board, Delhi. According to Biswas, it takes about 100 to 400 years to form the 10 millimetres of the topsoil; 30 millimetres of topsoil takes as much as 3,000 years to 12,000 years to form. The Technology Information, Forecasting & Assessment Council -- tifac, an autonomous body under the department of science and technology, promotes use of flyash in bricks to save topsoil -- in a national seminar on building components made a presentation which shows that the current annual requirement of bricks in India is 150 billion. This means digging up nearly 300 million tonnes of topsoil: a mass stripping of around 20,234 hectares of agricultural land goes in brick manufacturing every year. But the actual damage could be more than what tifac has estimated (see box: Lump sum). Tez Singh, 67, is of Ardaspur village, district Aligarh, on the Aligarh-Mathura highway. "Eleven years ago, I gave 10 bighas of land, at Rs 15,000 per bigha, for three years to Laxmi Brick Industry." He points towards the opposite side of the road. "Soil was to be dug up to four feet. This land, on which I am sitting; it was given back around eight years ago." Today, the rate here is Rs 25,000 per bigha. "Now my younger brother has leased five bigha s of his land to the same brick kiln." What is the condition of his land? "The first year, we just filled up the field with water. From the second year onwards, we started putting fertilisers and water alternatively. This continued for two years. In the fourth year we grew barsim (cattle feed) and put it back into the field, to improve fertility. This continued for two more years. Barsim apart, we kept on putting quintals of fertilisers." The result? "Still the yield is not more than half of what it used to be 12 years ago," says Tez. Then why did he give his land? "Out of need. I put a bore-well in my fields, for which I had taken a bank loan. Also, the marriage of my granddaughter was approaching. I was not able to pay the loan instalments, leave alone marriage arrangements. So I myself went to the kiln-owner. He happily took my land on rent; it was right in front of his kiln." Apart from the loss due to non-production, Tez has spent nearly half the amount he had got from the kiln-owner on regeneration. But he has no regrets. "I am happy because I could get my granddaughter properly married off, and am thankful to the Laxmi bhatta ; it helped me in need." Tez is not the only farmer to be "happy". Two years ago, Ram Swaroop gave eight bighas to a brick kiln on the outskirts of Bulandshahar at Rs 27,000 per bigha for three years. All he wanted was a pakka house. "I have nearly 40 bighas of land. Even then, I was not able to build a pakka house for the last ten years. Had I not given the land on rent, I am sure I would still not be able do the same in the next ten years." Ram Swaroop used to make about Rs 3,500 per bigha; he would have made about Rs 10,500 on that bigha in three years. "Which is nothing compared to Rs 27,000. On top of that, I didn't have to do anything for this money," he says enthusiastically. Laments Surendra Kumar, a resident of village Parsotigarhi in district Mathura, "Every morning we find a layer of black particles on our rooftop and in our fields. Our clothes become blackish within 4-5 hours. Black particles collect in our nostrils." His village is not the only one finding it difficult to cope with growing pollution in the area. The informal brick industry is the third largest consumer of coal in the country, after power plants and the steel industry. Says Mahesh Sharma, a kiln-owner near Imaliya village, district Bulandshahar, "It's actually the cost and consumption of the coal that decides the rates of bricks and our profit margins." But coal contributes heavily to the particulate emissions kilns are notorious for (see box: Jet black smoke). Kilns also use biomass, primarily rice husk. But what really causes the black smoke to spew from chimneys is the use of rubber as a fuel. Kiln owners use rubber and waste oil as fuel because production capacities have grown, and coal doesn't suffice. At least in eastern Uttar Pradesh, the demand is so high that rubber scrap dealerships have emerged as a viable profession. Says R K Sharma, an Aligarh rubber scrap dealer, "A quintal of rubber scrap costs Rs 300 to Rs 400, much cheaper than coal. It's a good fuel because it burns for a longer time". It's collected locally, but "Sometimes we bring rubber tyres all the way from Lucknow and even from West Bengal." Burning tyres releases large amounts of the metal zinc, leading to increase in fine particulate matter related to respiratory and cardiac disease. Kilns lack state-of-the-art particulate controls needed to capture this fine soot. Burning tyres also releases dioxin, recognised by us epa in 1985 as the most potent human-made carcinogen known. Dioxin does not break down in the environment but builds up in the food chain, concentrating in meat and dairy products. Are brick kilns regulated? The Central Pollution Control Board (cpcb) has set two kinds of standards, one for chimney height and the other for emissions. The first was drafted in 1987, to put a stop to the (then) prevalent practice of using movable chimneys. A 1993 Food and Agricultural Organisation of the United Nations estimated that there were in India nearly 100,000 brick kilns, out of a total of 115,000, that were using movable chimneys. The idea was to put paid to the problem that movable chimneys had: its emissions do not disperse, because of its lesser height. "Existing moving chimney Bull's trench kilns shall be dispensed with by December 31, 1987 and no new moving chimney kilns shall be allowed to come up", says the 1987 law. But the brick industry, a powerful lobby, got the implementation of these standards delayed. The time limit to weed moving chimneys out was extended twice: to June 30, 1999 and then to June 30, 2000. In 1996, cpcb stipulated emission standards for kilns (see table: For particulates only). But limits are set only for particulate matter. What about kilns that use rubber, as in Ardaspur village in western Uttar Pradesh. In any case, cpcb can only make standards. So who regulates even for the limited standards? No one knows. The net effect? "The yield has declined drastically in the area, as the temperature has risen. Dew formation has decreased due to the heavy pollution in the area. Now in morning, we find a layer of black particles on our crops leaves instead of dew that we used to get earlier," says Surendra. Though cpcb and State Pollution Control Board officials have a fair idea of damage caused by these units, action is taken only when courts intervene (see box: Like a tonne of bricks). Apart from coal price fluctuations, kiln profitability depends on managing labour. Singh outlines the modus operandi: "The labour do not work on their own. You have to keep standing there to get the work done. Otherwise you would run a loss." But such surveillance serves another purpose: proper exploitation. Running a bhatta requires no expertise. "All you need is a pakka munshi (tough manager) with work experience," says Singh. "He and the phukaiya (the firer) are hired on a monthly salary. The rest of the labour works on a contract basis." Depending upon the work, four types of labourers work the kiln -- the nikasiwala (who takes out burnt bricks), pathiaya (who makes bricks from soil), bharaiya (who puts mud-bricks in) and phukaiya (firer). They co-ordinate to complete a circle around the chimney. The number of bricks made after a circle is completed depends on the kiln size, and varies from 600,000 to 900,000. Nikasiwalas collect the burnt bricks on one side while bharaiyas place raw bricks pathaiyas have made on the other. Phukaiyas continuously burn bricks between the two ends. "Profitability," says Singh, "Depends on how quickly the circle is completed without any fuel or labour problems". This is where 'managing' occurs. "We have to get more work from the labour and ensure that nobody runs away," Singh explains. "If any of the four runs away, the cycle stops. Loss." The labourers are hired through a contractor, who takes a cut from the labourers' wages and provides substitutes if a worker runs away. Says Hari Om, "Last year, I hired seven phukaiyas directly. One night, five of them ran away. You can't do much, for most of the labour is migrant labour, you don't even know their exact address." At 10 pm, the two phukaiyas who hadn't run away informed Hari Om that the five had boarded the Sangam Express for Allahabad. "I immediately took out my jeep; drove to Allahabad with friends," Hari Om recounts. "I caught them at Allahabad station and brought them back to the bhatta at gunpoint." All five were beaten up badly and their money confiscated to ensure they wouldn't run again. Why go to such lengths? "The work stopped for 24 hours. In peak season, such stoppage means loss. They were beaten up so that others would think twice before running away," he says. Now, Hari Om hires labour through contractors. Of the workers, the phukaiya is usually a migrant. This is not surprising, for no one wants to do a phukaiya's job. "It's the most dangerous work in a bhatta. While working we have to stand on burning bricks; black smoke constantly comes out. We work 14 hours a day. People get burns; sometimes they even burn to death. That's why nobody wants to do it, at least locals don't," says Phool Chand, 35, from Bharvari village near Allahabad. He has been a phukaiya for 18 years. "Do I have any choice? My problem is that of all who come here. They cannot say 'no'; they are the needy. So most migrants play with their lives for a measly sum of Rs 2,000." Phool Chand gets Rs 2,500; he is team leader, experienced. Most migrants labour come en familie. "Here, there is work for more than six to seven months. How would we manage our expenses in the other five to six months if we don't save? So, the whole family gets into this business," says Phool Chand. Rapes and money-snatching are part of the migrant family's lot. Many cases do not even come to light. Locals are comparatively fortunate; they do the other three kinds of work. 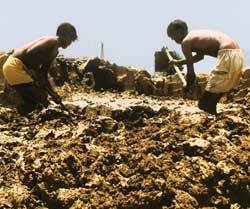 A pathaiya gets about Rs 150 for every thousand mud bricks he makes. Since their work is incentive-based, they work in families. Says Bhudev, 12, who works with his father as pathaiya at a kiln near Aligarh, "We are four brothers; we all work as pathaiyas in different brick kilns. Here, I am working with my father. 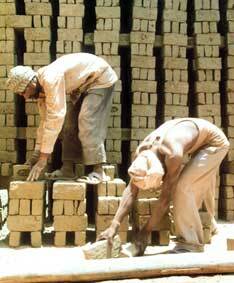 We together make around 1,500 bricks everyday and earn Rs 225." Bhudev belongs to Bhuriaghari village, ten kilometres from the kiln. Bharaiyas and nikasiwalas get Rs 45 to Rs 55 for every thousand bricks they place or collect. In September 1999, the Union ministry of environment and forests (moef), seeking to conserve topsoil and promote flyash utilisation by the brick industry, issued a notification: "No person within a radius of 50 kilometre from a coal- or lignite-based thermal power plant shall manufacture clay bricks/tiles/blocks for use in construction activities without mixing at least 25 per cent of ash with soil on weight to weight basis". Kiln owners have been playing truant with this notification. "As per the notification, thermal power plants were supposed to give flyash free for at least ten years from the date of notification. But they are not making it available," complains Verma of the All India Bricks and Tiles Manufacturing Federation (aibtmf). His complaint is justified. "Transporting flyash is also a big problem for us," he adds. "Since flyash has very thin particles while transporting it flies in the air. And the major problem is to handle labour to use fly ash." The notification was amended on August 27, 2003 and the 50-km limit was extended to 100 km. The limit on the percentage of flyash to be mixed was increased to 75 per cent by August 2006 and 100 per cent by August 2007. But according to aibtmf , out of the 60,000 kilns spread over India, not even a thousand of them are using flyash. "As per the flyash notification, by year 2007 we are supposed to make bricks using 100 per cent flyash. This is a major problem for us. The one who produces flyash should use it. Why should brick-kiln owners use it?" rues Surendra Pratap of aibtmf. In October 2004, aibtmf called for a nation-wide strike against the notifications. Kiln owners courted arrest nation-wide and brick production almost stopped for at least three and half months. The strike was effective. Apparently, a few brick making units of Uttar Pradesh, Rajasthan and Punjab have got a stay order from courts against the notifications. One of these petitioners is Satish Kumar, owner of Arya Brick Field, a brick-making unit in district Muzaffar Nagar, Uttar Pradesh. Satish had filed a writ petition in Allahabad High Court. On March 13, 2004 he got a stay order against the notification. "The modality of distribution of 50 per cent flyash among the brick kiln manufacturers situated within 100 km is not mentioned in the notification at all," the High Court said. It is clear the government has merely imposed a law. The stipulation to use flyash is a noble one, but the government has to go beyond lawmaking to create a system that will literally ease the flyash into brickmaking. It has to provide incentives, so that kiln-owners get around to using this waste product. Also, it must widen the ambit of flyash use. An ideal use for it is in making Portland Pozzolana Cement (ppc), but government has nothing to promote its use in the cement industry. 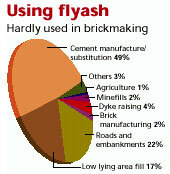 As of now, the responsibility to use flyash is largely with brickmakers. As of now, the attempt to block the gargantuan abuse of precious topsoil remains stymied. The kilns are blithely churning out bricks. They have a cast-iron excuse: everybody needs them.